Many Vietnamese young people’s great passion for business and novel, feasible ideas, which are attracting interest from foreign investors, are contributing to turning Vietnam into an incubator for high-potential startups. But is this enough for the country to develop its own Silicon Valley? 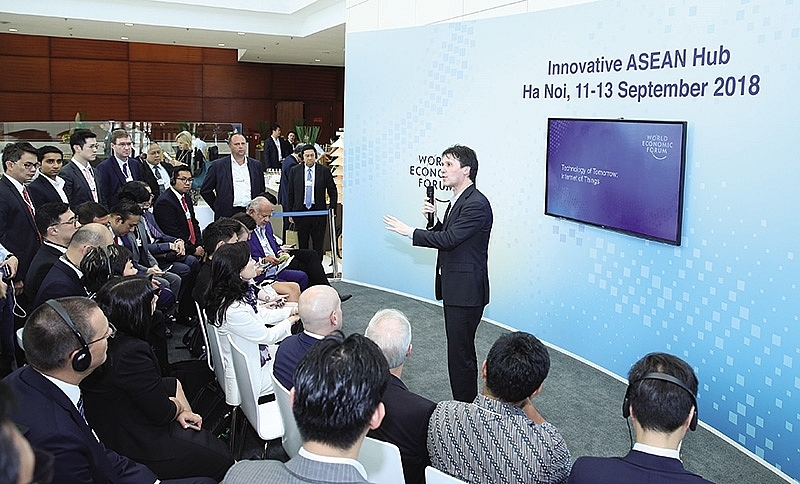 At last week’s World Economic Forum on ASEAN (WEF on ASEAN 2018) held in Hanoi, Hachi was among the several Vietnamese startups on the list of the most creative startups selected by the WEF to partake in the WEF on ASEAN 2018. “This agritech startup has built more than 12 ‘smart farms’ in Vietnam. They use Internet of Things sensors and a hydroponic system, which is a way of drip-feeding plants water and nutrients, which saves waste. They claim the approach has led to a 300-per-cent increase in productivity,” the WEF explained picking Hachi on its website. During 2015-2016, Nguyen Xuan Truong, the founder of Hachi, began thinking about establishing this startup, when he saw that the domestic foodstuff market was flooded with unsafe products. Hachi received investment from the Vietnam Silicon Valley (VSV) project initiated by the Vietnamese government and the Ministry of Science and Technology in 2013. Other Vietnamese startups listed by the WEF include BrandBeats Music Marketing by founder Le Tan Thanh Thinh, LOGIVAN Technologies Pte., Ltd. with its founder David Salt, and Rynan Smart Fertilizers JSC with its founder Nguyen My T.
At present, Vietnam is home to about 3,000 startups like Hachi, operating in various sectors such as e-commerce, healthcare, fintech, and food tech. Last week, Go-Jek, a ride-sharing company valued at $5 billion, launched its Go-Viet service in Hanoi, after having recently launched this service in Ho Chi Minh City in co-operation with a Vietnamese partner. According to Dezan Shira and Associates, a pan-Asian, multi-disciplinary professional services firm, last year, 92 Vietnamese startups received investments worth $291 million, 42 per cent higher than 2016. Meanwhile, the number of startups rose by 45 per cent. Domestic investors made up $46 million, while foreign investors accounted for $245 million. The number of deals soared from 50 in 2016 to 92 last year, with 61 per cent of the projects receiving investments of less than $1 million. Foreign investors engaged in only 28 deals, while local investors accounted for 64 deals. The top six deals alone amounted to $198 million, according to “Vietnam Startup Deal 2017,” a report compiled by the Topica Founder Institute. Major deals included Sea Group acquiring an 82-per-cemt stake in Foody for $64 million and stakes in other startups for $50 million. Meanwhile, JD.com invested $54 million in Tiki.vn. E-commerce, fintech, and food tech were invested in the most, with e-commerce seeing 21 deals worth $83 million, food tech two deals worth $65 million, and fintech eight deals valued at $57 million. Other sectors that received investments include online travel, logistics, and media. To encourage entrepreneurship and to gradually build up a Vietnamese Silicon Valley, the Vietnamese government has established a number of funds at state and provincial/municipal levels to support startups. In addition, it has collaborated with other countries and banks to develop funding and innovation programmes in order to provide loans, technical training, and business mentoring. For example, in Ho Chi Minh City, a $38.5-million, 52-hectare Saigon Silicon Valley was created based on the US model. This centre aims to lure businesses founded by overseas Vietnamese and foreign corporations in high-tech and supporting industries, research, innovation, and transfer applications. Besides, the VND11.75 billion ($519,900) SpeedUP fund set up by the Ho Chi Minh City Department of Science and Technology has invested in 14 startups, with investments ranging from VND350 million ($15,486) to VND1.3 billion ($56,725). Meanwhile, the Hanoi People’s Committee launched Startupcity.vn, an online platform that contains details about startups and investors. It is aimed to connect investors with entrepreneurs. Tran Hoang Thang, accelerator programme manager of the Vietnam Silicon Valley Accelerator, which implements VSV that provided investment for Hachi, told VIR that every year, VSV raises funds from angel investors to invest in a batch of early-stage startups in Vietnam. Each batch consists of eight to 20 startups. Each startup receives $10,000-20,000 in exchange for 5-10 per cent of their company’s profit. During the 2014-2017 period, VSV invested in 50 startups, which operate in various sectors such as IT, logistics, drones, and foodstuff. Many startups invested in by VSV have successfully called for the next round of investment with a multi-million-dollar valuation, including TechElite, Lozi, SchoolBus, and Ship60. In 2014, student Nguyen Hoang Trung and five friends, all born in 1994 and with their university educations unfinished, established Lozi.vn, a page for food that reminds many consumers of Pinterest. Right after the launch, the page attracted about 5,000 users a day. After 12 months, the figure rose to 200,000. Lozi.vn also got a VSV investment of $10,000. Currently, the website’s monthly revenue is about $10,000. According to Dezan Shira and Associates, the major challenges facing the startup community in Vietnam are the lack of talented workforce, funding, scale, and the slow regulatory reforms. Truong of Hachi told VIR that with investment from VSV, he has weathered difficulties by gradually expanding the firm’s customer base with higher-quality products. Currently, Hachi has several vegetable farms covering more than 20,000 square metres, employing over 100 farmers. “I want to expand the company’s operations, but it is not easy, as I currently lack capital,” Truong said. However, Prime Minister Nguyen Xuan Phuc said he expected that many of the foreign startups present at the WEF on ASEAN event last week would be able to find opportunities to co-operate with domestic startups. “The participation of 80 startups from the ASEAN promises good co-operation in the future. The Vietnamese government wants to see more such co-operation, in order to tell the world that the co-operation in startups is expanding within the region,” said PM Phuc.